We summarise all we know about Pokémon in the newest entry in Super Smash Bros.! The newest title in the Super Smash Bros. franchise, Super Smash Bros. Ultimate, was announced today for release on the 7th of December. One of the biggest features shown off was that every character from the franchise returns. This includes every single Pokémon fighter character! This article summarises all we know about returning Pokémon fighters, stages and Poké Ball item Pokémon in this newest iteration of Smash Bros. We’ll update the list as more content comes through – if you’ve spotted something we’ve missed, let us know! A lot of the observations come from this extensive list. Official videos and screenshots meanwhile come from the official Smash Bros. website. A total of seven different fighters are confirmed – and one is technically three in one! We may yet get another character from the franchise, but there is no indication either way on this yet. Pikachu is one of two Pokémon characters hailing from the first Smash Bros. title. This Electric-type has gained two alternate costumes; one for the Libre form, and another sporting the hat from the Pokémon Sun and Moon female protagonist. In return, Pikachu no longer has two skins, thought to be the fighting band and goggles skins. Notably, both of the new costumes comes with a heart-shaped tail, an indication that the Pikachu in these get-ups is female. With fighting, Pikachu has a new Neutral Air attack, which lacks lag. His Down Air attack meanwhile spikes, while the cloud from Thunder retains its spiking quality too. Jigglypuff is the other Pokémon character who has appeared in every Smash Bros. title. Thus far no major differences have been noted! 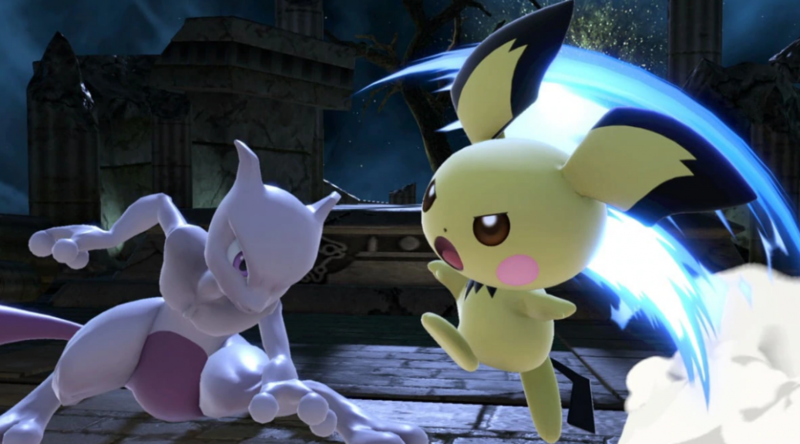 Pichu is one of two additions to the Melee roster, but unlike Mewtwo never appeared again… until now. It retains its gimmick of hurting itself when performing Electric attacks, but the payoff is these attacks are stronger than Pikachu’s. Pichu’s Forward Smash attack appears to be electrical now, but no other changes have been yet observed. Pichu was very light and not regarded as a strong character in Melee, so we’ll see if Smash Ultimate has been kinder to the little rodent. Mewtwo was in Smash 4, and one of the lightest of the floaty characters about. He has new animations for his Dash, Down B and Neutral Air attacks, and his Up Smash attack involves him summoning a galaxy now. Talk about showing off! He also appears to have less lag on Teleport and Disable, which could help him out a fair bit. This character is really three in one! Seen only in Brawl, this character could switch between three Pokémon with the Down B Special attack. In fact, this was required – each Pokémon would tire out after a while and so need to be switched. In Smash 4 only Charizard survived the cut, and hence its Down B Special attack changed. Pokémon Trainer/Charizard is likely the one who will changed the most in this game. A confirmed major change is that each Pokémon no longer gets tired out, so there is no need to change frequently in the one fight. This probably results in re-balancing in various areas, and (unless Switching uses a different input) a loss to Charizard’s new Down-B move. So far, Squirtle has a new Dash Attack, and Ivysaur has a new finishing effect on its rapid jab attack. Switching is also faster than before, and comes with brief invincibility. Oh, and there’s now a female version of Pokémon Trainer as well, based on Leaf (the female protagonist of Pokémon Fire Red and Leaf Green). Now that’s a change! Lucario’s gimmick is that the more damage it has suffered, the greater the power of its Aura-based attacks. The trick is to suffer a lot of damage without getting knocked off stage! There has not been any major changes as of yet for Lucario. This writer’s personal hope is that its yellow Shiny form finally becomes an alternate skin in Smash. So far, only one stage from the Pokémon franchise has not been sighted yet – Poké Floats, from Melee. This stage featured a lot of differently shaped balloons shaped as Pokémon which you jumped on and off as the camera moved through the sky. Saffron City, Pokémon Stadium, Pokémon Stadium 2, Spear Pillar, Prism Tower, Unova Pokémon League and Kalos Pokémon League have all returned. Many Pokémon characters appeared in Smash as an item from Poké Balls. While it’s not known if every Pokémon that appeared in previous Smash titles will appear, it is likely at least those seen in Smash 4 will be seen again. Old ones seen thus far include Meowth, Deoxys and Scizor. Which is your favourite fighter from the series? Are you hoping for any generation seven Pokémon to become a fighter? Previous PostNew Pokémon Let’s Go footage shown at E3, Mew Gift from Poké Ball PlusNext PostExciting Additions and Events coming to Pokémon GO This Summer!